Rgbatduke (aka Robert G Brown of Duke University aka the DuKE), Monckton, Spencer & Christy and now Willis Eschenbach and WM Briggs having a right old ding-dong battle. It's another battle of the DuKEs. Here is where it started, here is a continuation, and then WM Briggs "statistician to the stars" dealt a blow to deniers by saying what Professor Brown wrote was complete and utter nonsense. This is the latest (h/t Nick Stokes). I know you’re a great statistician, and you’re one of my heroes … but with all respect, you’ve left out a couple of important priors in your rant …. 1. You assume that the results of the climate model are better than random chance. 2. You assume that the mean of the climate models is better than the individual models. 3. You assume that the climate models are “physics-based”. As far as I know, none of these has ever been shown to be true for climate models. If they have, please provide citations. As a result, taking an average of climate models is much like taking an average of gypsy fortunetellers … and surely you would not argue that the average and standard deviation of their forecasts is meaningful. 1. Do ensemble models make statistical sense in theory? ...3. A model does not have to explain the physics to be good. Stop and re-read that before continuing. Poor Wondering Willis. He probably won't know what hit him. 2. Are the ensemble climate models good? As I said originally, not for long-range predictions, but yes for very short-range ones. If Brown wants to claim long-range models are poor, even useless, then I am his brother. But if he wants to say that they do not make statistical sense, then I am his enemy. Being “good” and making “statistical sense” are different and no power in Heaven or on Earth can make them the same. TWO Are the ensemble models used in climate forecasts any good? They don’t seem to be; not for longer-range predictions (and don’t forget that ensembles can have just one member). Some climate model forecasts—those for a few months ahead—seem to have skill, i.e. they are good. Why deny the obvious? The multi-year ones look like they’re too hot. Well, that's weird. WM Briggs argues at length based on "statistics" but then dismisses climate models because "it looks like they're too hot". That doesn't sound to rigourous an assessment, does it. And he talks about climate model forecasts of "a few months ahead". I don't know of any such climate model forecasts. Climate models by definition model climate, not a few months of weather. Short term (15 years or less) trends in global temperature are not usefully predictable as a function of current forcings. The clear message from our signal-to-noise analysis is that multi-decadal records are required for identifying human effects on tropospheric temperature. Minimal warming over a single decade does not disprove the existence of a slowly-evolving anthropogenic warming signal. Ice will continue to melt - including Arctic sea ice and the worlds glaciers and ice sheets. You can see this in the latest annual update on realclimate.org, which looks at the extent to which models are getting it right. Climate science deniers ignore what is "right" about the models. They all show surface temperature continuing to rise, for example. And they estimate the expected rise within a specified range for explicit scenarios of future emissions. They can provide explicit estimates of climate sensitivity and transient climate response - within a range. Policymakers are relying on these models to represent the RANGE of possible future climates that are consistent with known physics and chemistry. To do what, exactly? Are they making preparations or just looking for a revenue source? The thing many climate science deniers have in common is an unwillingness to accept that the deleterious affects of climate change carry a cost. That will apply regardless of whether we do nothing or do something beforehand (like shifting to clean energy) or wait till after the damage is done (like paying flood levies to repair broken infrastructure). PPS (23 June 2013) Looks as if WM Briggs is trying to backtrack from his comment about short term climate models by saying he meant the models used for weather forecasting and seasonal outlooks. I know they are called "climate" models too, although they model weather, not climate. And they are constantly updated with real data through data assimilation unlike the climate models rgbatduke was writing about. So this "fervent, ill-educated activist" is sticking to her guns. WM Briggs was wrong, plain and simple in what he said. His article was in relation to IPCC models, which are a somewhat different beast, used for a different purpose and having different features. The climate models being discussed here are built to learn about climate not to forecast weather. As far as I can tell, denialists of all kinds break up into little cliques defending their own phoney theories. Climate deniers are in that process but because this site attracts so many flies to the manure pile, the process is obscured a bit. But you just have to see the range of hypotheses they put forward to deny climate change to know that they can't all be right. I think of science like sharpening a pencil - the more actual science we do, the closer to the perfect point we get. Denialists work in crayon. When I say this site I mean WUWT - truly a pile of dung. Sou's site is fragrant and free of annoying insects. I like that. "Denialists work in crayon". Free market ideology is a predictor, but not all free marketers reject climate science thank goodness. Denialists work in crayon because they are not allowed anything sharp. I agree about the conspiracy ideation. Voisin in his own comment to his insect rubbish admitted as much, that he doesn't want a new world order. But if he uses Google, has Intel inside and Windows 8 to surf the Net, he's joined the new world order. He and other deniers misuse it to hide in their bedrooms and shout "I'm not coming out until I get what I want." Meantime, life goes on all around you. Perhaps it's the global bit they don't like. Sadly for them, reality doesn't listen. WM Briggs seemed to think he was engaged in a "scientific debate". If he ever went to a scientific conference or read any scientific literature, then he learn what a scientific debate is. It's not a bunch of DuKEs playing "not even wrong" one-upmanship with each other. 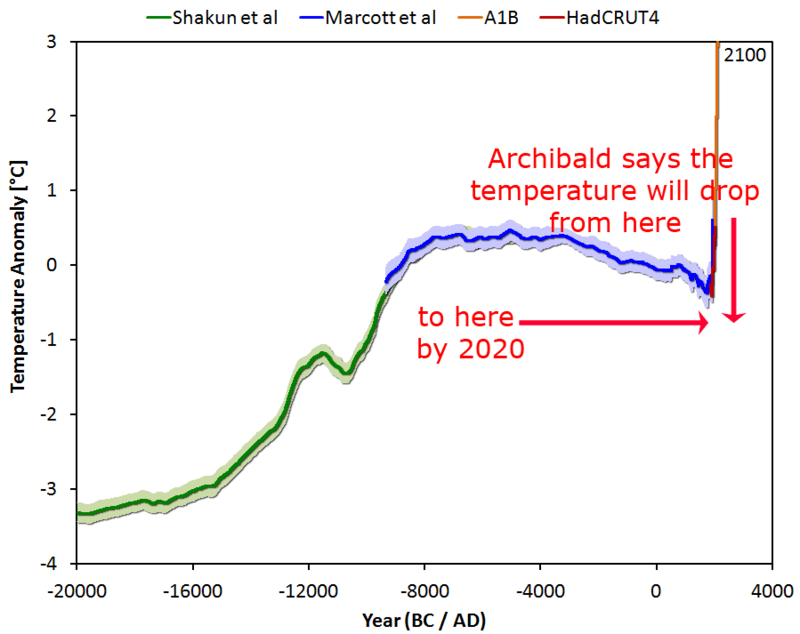 If the human influence on planetary warming was such that it could always be detected with statistical confidence in less than 15 years, I'm confident that the Earth would be unable to support any semblance of civilisation by the end of the 22nd century. 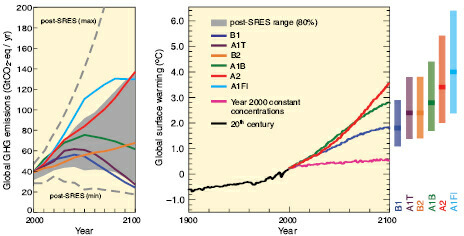 If the human influence on planetary warming was such that it could always be detected with statistical confidence in less than 10 years, I'm condfident that the Earth would be unable to support any semblance of civilisation as we enjoy it by the end of the 21st century. I'm trying to lead the Denialati that infest Deltoid to explore the finer points of these notions, but so far they've been studiously avoiding even the questions I've laid as groundwork for such further exploration. 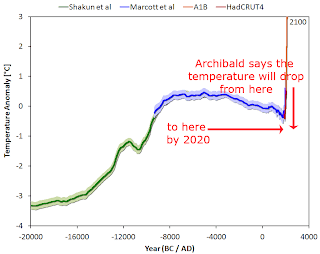 For those that might have missed the corollary to my previous post, what deniers are really saying with their "it hasn't warmed for 17 years" meme is that "it hasn't warmed sufficiently rapidly that we can guarantee to wipe human civilised society from the face of the planet in the next century". If that's their criterion for demonstrating climate change to their satisfaction, they're no more than a bunch of seriously fucked-up sociopaths. Your dismissal of Curry was perfect. She long ago left the scientific community. Maybe one of the Koch brothers has a spot for her.